Bri Sims named LSC Hitter of the Week after a superb opening week. 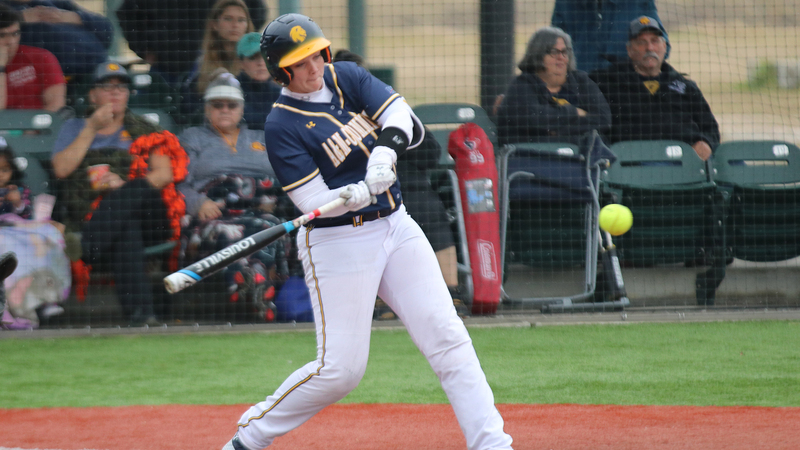 RICHARDSON– Texas A&M University-Commerce’s softball player Bri Sims has been named the Lone Star Conference Hitter of the Week. The player of the week awards was announced by the conference office on Tuesday. It is the first Hitter of the Week award of her A&M-Commerce career. Sims­– a senior from Rowlett– saw her bat come alive in the opening weekend of action for the No. 9 Lions. She had three homers and eight RBIs as she helped the Lions pick up five wins at the Arkansas Tech Winter Classic. Sims had the game-winning RBI in the first two games of the weekend. She hit a two-run home run in the seventh inning as the Lions defeated St. Mary’s 2-1 in the season opener. She followed that with a solo home run and a two-run single against No. 20 Arkansas Tech, which gave the Lions the lead for good. Sims also hit a home run against Central Oklahoma and had three RBIs. She had hits in five of the six games and reached base in every contest. Sims currently leads the LSC in home runs and RBIs, is third in total bases and fourth in slugging percentage. Sims and the No. 9 Lions return to action this week for their second week of work. They travel to San Antonio for five games over three days span. They will face New Mexico Highlands on Friday at 12:15 p.m. before playing tournament host St. Mary’s at 4:45 p.m. The Lions will then face Drury and Regis on Saturday before finishing the week against Colorado Mines on Sunday. The Lions already have wins over Colorado Mines and St. Mary’s this season. The Lions will then return home for their home opening series against MSU Texas, which begins Feb. 15. Season tickets for Lion Softball home games are available for $70 with a total of 21 games spanning 13 different dates. Tickets can be purchased by visiting WeAreLionsTix.com, calling Lion Sales & Service at (903) 468-8756, or visiting the LSS Box Office in the Field House during business hours.